Living in an apartment, my lawn consists of about 60 feet of concrete, sporadically coated in vomit and pigeon poop. But I'd still like a $12,000 Evatech GOAT Robot 22T lawnmower all the same. 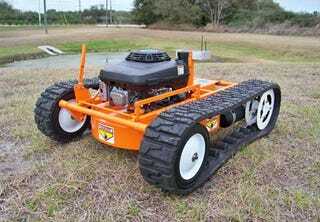 Evatech's latest and greatest R/C "hybrid" mower can be manned from up to 2,000 feet away as it takes on 70-degree slopes at 8MPH. Its track system not only creates stability—it's perfect for winter traction as you can plow your driveway with a shovel attachment. Keep in mind, since the 22T can both cut grass and plow snow, you're really only paying about $6,000 per function—that's like half the listed price!